Four excellent fixtures featured on the third day of play at the 2018 ITTF Team World Cup in London with two teams making the headlines across both the Men's Team and Women's Team events on Saturday 24th February. Here’s a quick summary of how day three played out at the Copper Box Arena. Japan enjoyed a near perfect result in the first Women’s Team semi-finals tie of the day as the no.1 seeded team held off silver medallists from the 2015 edition of the event DPR Korea. Starting off the match with a doubles win courtesy of Mima Ito and Hina Hayata, who accounted for Kim Nam Hae and Cha Hyo Sim (11-3, 11-8, 12-10) Japan then went on to establish a 2-0 advantage after Kasumi Ishikawa avenged her Rio 2016 loss to Kim Song I with a powerful performance in London (11-3, 11-8, 11-7). Cha Hyo Sim came the closest to denting Japan’s hopes but ultimately lost out to Hina Hayata across four games (11-8, 11-13, 11-9, 11-9) as DPR Korea’s chances of reaching the title match faded. Joining DPR Korea in the bronze medal position is Hong Kong following their 3-0 defeat at the hands of China. Fielding Zhu Yuling and Ding Ning in the singles, who picked up victories over Doo Hoi Kem (11-4, 11-3, 10-12, 11-6) and Ng Wing Nam (11-4, 11-8, 11-5) China also emerged triumphant in the doubles contest with Ding Ning and Liu Shiwen proving too strong for the partnership of Soo Wai Yam Minnie and Ng Wing Nam (11-9, 11-7, 11-5). Spectators were treated to a thrilling Men’s Team semi-finals duel between Japan and Korea Republic, a match which ended up going the full distance. Following a doubles win for Team Japan, 14-year-old star Tomokazu Harimoto stepped up to extend his team’s advantage with a positive outing against Jeong Sangeun (11-9, 11-9, 8-11, 11-7). Korea Republic then responded with two victories of its own; Jeoung Youngsik and Lee Sangsu kept the fifth seeds in the tie with respective successes against Koki Niwa (11-7, 7-11, 11-9, 11-9) and Tomokazu Harimoto (8-11, 6-11, 11-2, 16-14, 11-8) to draw the scores level. Jin Ueda and Jeong Sangeun then featured in a terrific fight in the final fixture of the match which the former of the two players won by a dramatic 16-14 points score in the deciding game (12-10, 5-11, 6-11, 11-6, 16-14), sealing Japan’s spot in the final. The host nation’s dreams of appearing in the Men’s Team final were crushed as England fell to a 3-0 defeat against defending champions China in the last four. Xu Xin and Ma Long teamed up for the Chinese doubles line-up, putting in a spectacular display against Paul Drinkhall and Sam Walker (11-2, 11-7, 11-4) to gain the lead. There was a small scare for the top seeds in the opening singles fixture as Fan Zhendong recovered from a game down to defeat an inspired Liam Pitchford (8-11, 11-3, 11-9, 11-9) but there was no such trouble for Ma Long, who thundered to a straight games triumph over Sam Walker (11-5, 11-1, 11-2) to seal the victory. 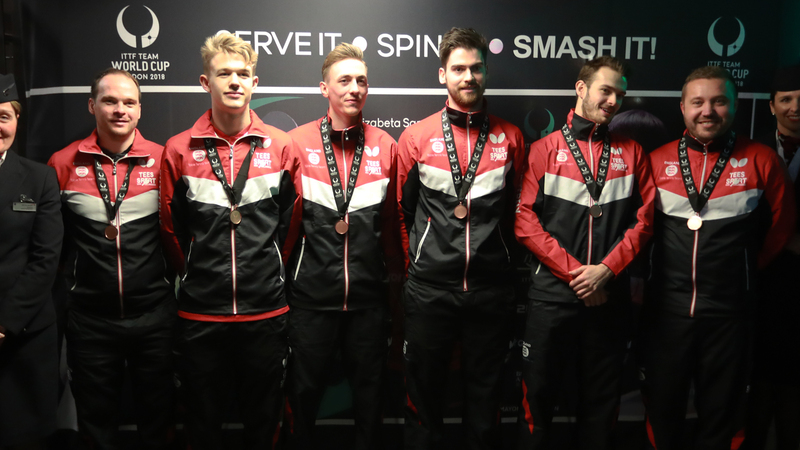 England receives another bronze medal two years after the team’s third place finish achieved at the Perfect 2016 World Team Championships.